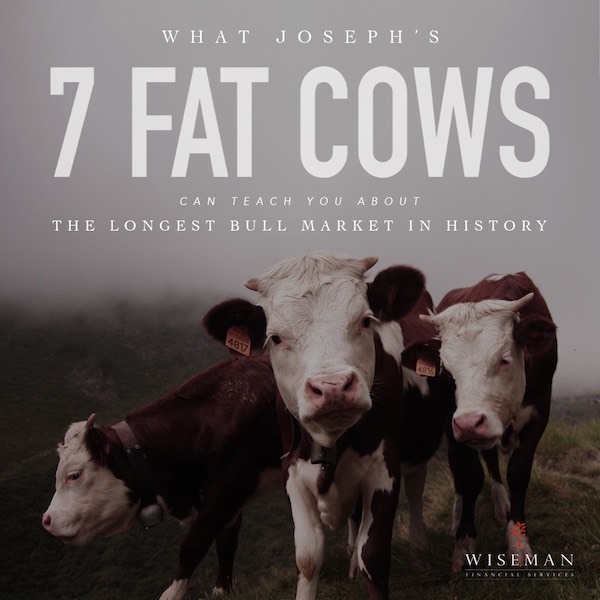 What Joseph's Seven Fat Cows can teach you about the longest Bull Market in history. Wiseman Financial Services has been operating in the Illawarra region since the early 1980's. While thirty-plus years is a long time, we are far from the first financial adviser to exist. That particular honor goes to Joseph, son of Jacob. The Biblical guy who wore the coat of many colours. The real Joseph, not Jason Donovan. Joseph a financial planner? Let me explain. Back in Joseph's day, the mighty Egyptian Pharaoh's assets were his land and agricultural crops. seven fat and seven skinny cows, seven healthy ears of corn and seven dead ones. were warning him about an impending famine across his lands. And right behind them fine healthy animals came seven other cows, skinny and vile. But it didn't make them fatter like I thought a monster supper should. This dream has got me baffled, hey Joseph, tell me what it means." what was ahead and encouraged the Pharaoh to prepare for a future of strife and difficulty. countries starved, and Joseph became a valuable asset to the royal family and Egypt as a whole. this is a period filled with investor confidence and consumer optimism. When Egypt's famine began, the full benefit of Joseph's strategy was realised. careful and aware of spending, financial commitments, and potential economic difficulty. So, how do we prepare for skinny cows and times of struggle? growing up in Canaan with his many brothers. Let's face it, he must have been pretty annoying for them to sell him off when they got the opportunity! help you use the years of fat cows to prepare for the future years of skinny cows. future - and we promise we won't sing!